Many of you know how much I love a good table-scape and home party.Well since I just moved into my new home and my girlfriends haven't had the chance to see my new house, I decided to have a cute brunch. 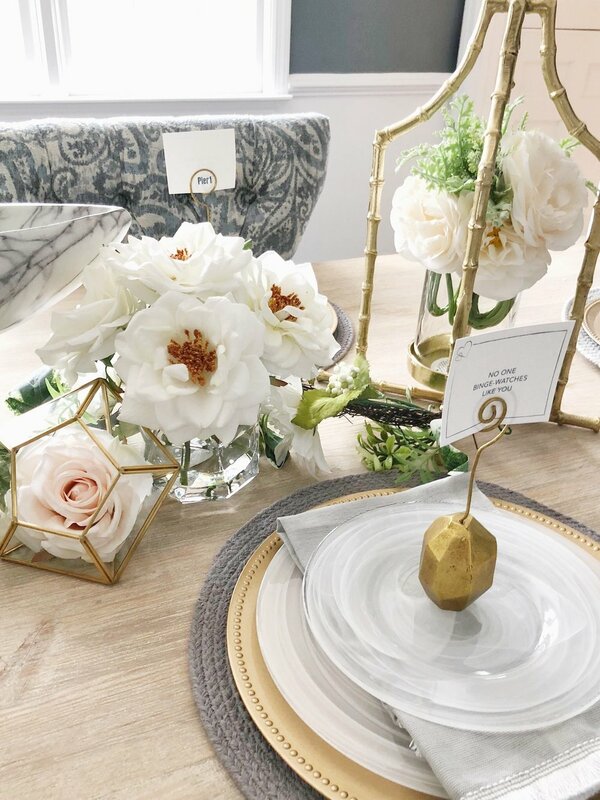 I tend to go overboard when planning my dinner parties, but honestly planning a little get together shouldn’t be hard and I want to share with you how I create the ultimate girls night at home and an amazing tablescape. First step: Decided a theme, as you can see I went with a earthy feel for my tablescape. 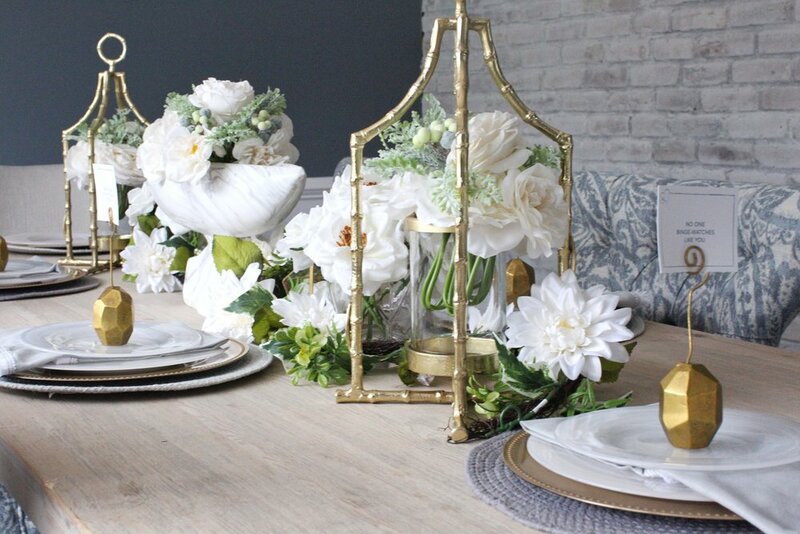 I am into gold and white tones as of late, so purchased lots of floral pieces and gold hardware. Simply head to your favorite home decor store and start shopping. Step 2: Look at your space!. You can go big or small, it’s all up to you when creating a dinner party for friends. I really like to see my space empty so I can visualize what I need to create my vision. 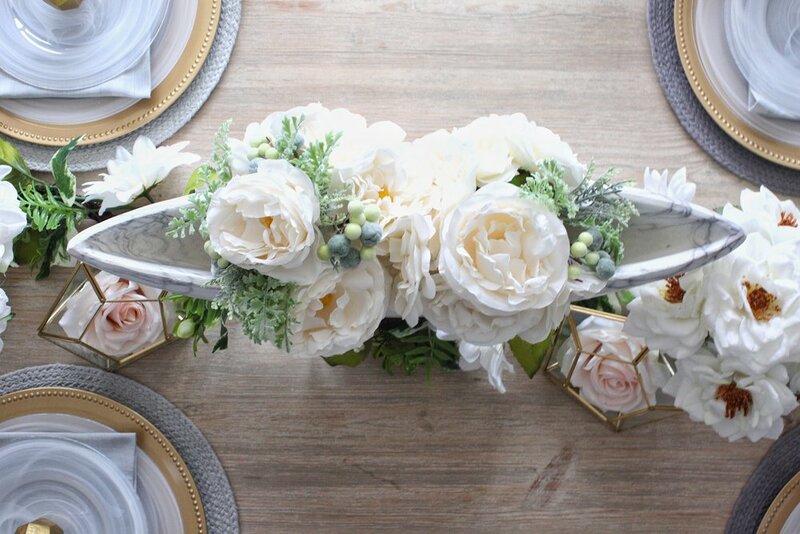 I like to go big so I use the whole space to really jazz my place up and it never goes unnoticed by my guest..
Step3: Decorating your table! I love plate chargers and they are usually are not expensive and it adds texture to your dinner plate. I actually went with different metals and textures and it worked beautifully. Don’t be afraid to add different elements because it can really make a difference in your presentation. Remember to always know how many guest you are having and purchase what you need by that number. I also love adding fun table cards, you can choose to add names or cute quotes like I did. Step4: Create a little mini bar section. 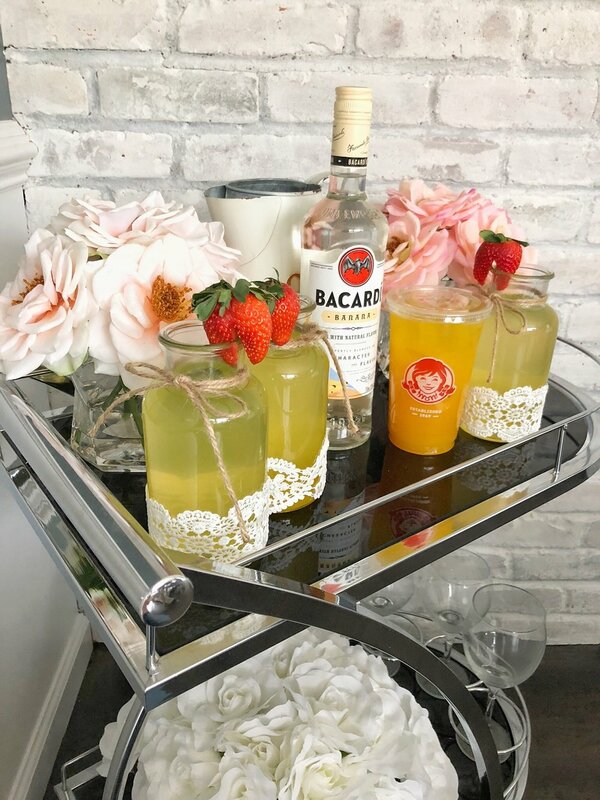 Bar carts are very big now, so you can be sure to find a cute one pretty much anywhere. 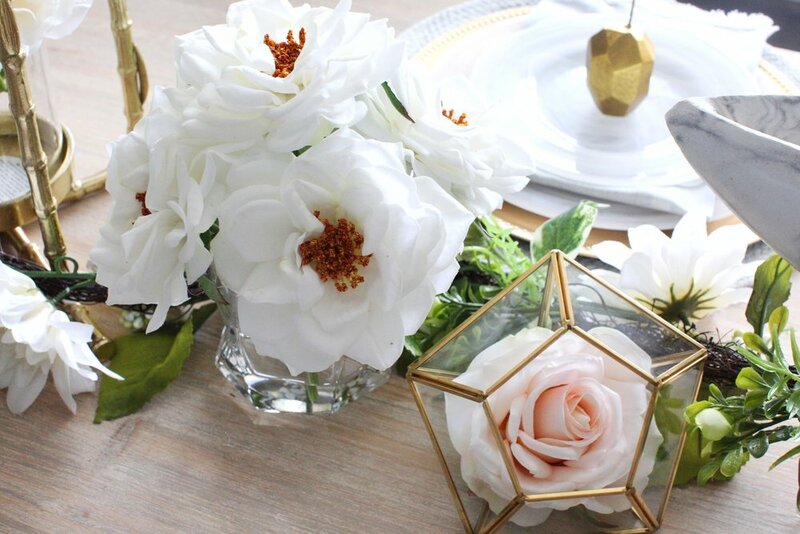 Jazz up your cart with florals or cute barware. I chose to add these cute milk glasses and used it as our actually cocktail glasses instead of my normal glassware. My friends really loved this touch. glassware. My friends really loved this touch. · Step5: Now onto the drinks! Most of the time my girlfriends and I don’t want to make stuff because this is our relaxed dinner. Hey don’t judge we are working moms, we need our mommy time. We usually do takeout and Wendy’s has some of our favorites. I decided to make a great drink using their new Signature Beverages, Mango Peach FruitTea Chillers®: hand shaken with freshly brewed, organic Honest® Tropical Green Tea and mango and peach flavored fruit juice, add that with Bacardi Banana Rum, the world’s favorite and most awarded rum and my friends you have a great drink. 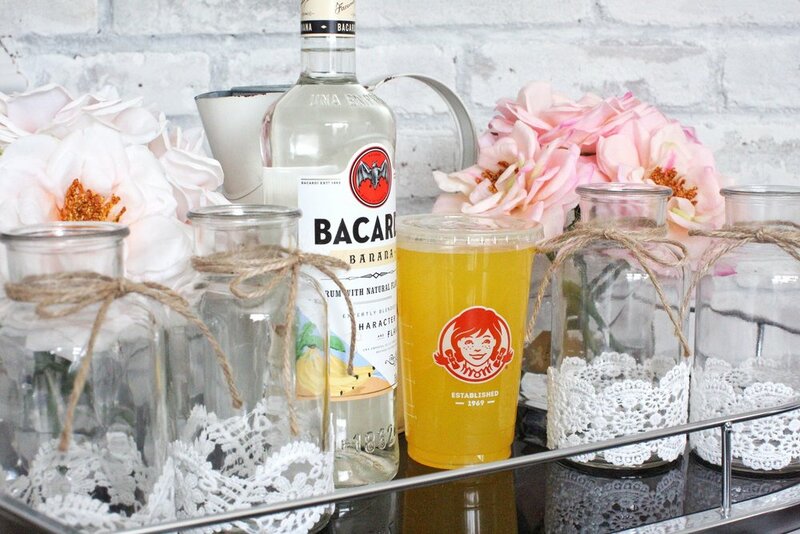 I am obsessed with this drink, the Mango Peach FruiTea Chillers® can only be found at Wendy’s and really pair well with any Bacardi flavor. I simply garnished it with a strawberry and there you have a cute cocktail for your guest. There you have it, a little party for you and your girls to enjoy the night at home.Whether you are choosing to make dinner, order food ,big table-scapes or small, your girls will enjoy their night in with you and that’s what counts. Overall my girlfriends loved my little setup in my new home and make sure to stay tuned for more tutorials on how to create cute tablescapes for your home.